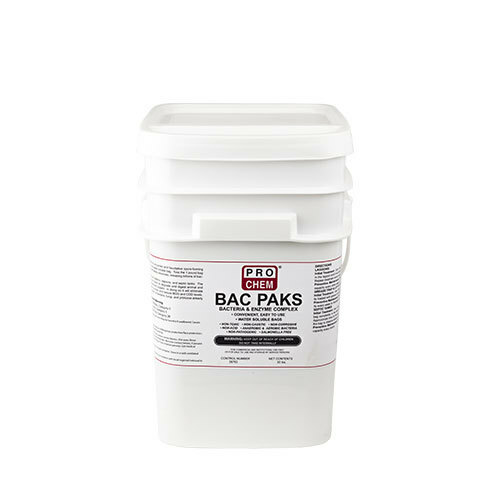 BAC PAKS | Pro Chem, Inc.
BAC PAKS are a dry, granular powder containing enzymes and spore-forming bacteria packaged in a convenient, easy-to-use, water-soluble bag. Simply toss the one-pound bag in water, and it completely dissolves in approximately five minutes releasing billions of bacteria and enzymes into the system. The high level of bacteria and enzyme activity will work to degrade and digest animal and vegetable oils and greases, proteins, starches and sugars. It also contains nutrients to simulate the growth of bacteria, fungi and protozoa already present in the system for additional results. 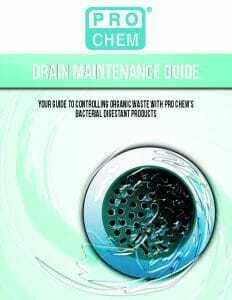 In doing so, it will eliminate odors, reduce suspended solids and sludge volumes and reduce BOC and COD levels. Grease Traps: Initial Treatment: Use 1/4 lb for each 5 cubic feet of trap capacity. Maintenance Treatment: Use 1/2 pound, weekly. Septic System: Initial Treatment: 1/2 pound for each 500 gallons of system capacity (or 1 pound per 2 people using the system). Maintenance Treatment: 1/4 pound monthly. Pit toilets: 1/4 to 1/2 pound per 500 gallon of capacity weekly.